The tallest, fastest and longest roller coaster in Orlando is coming to SeaWorld Orlando next year. Another site commented that the theme could be mako shark. I guess this means I’ll have to go next year as well. Typical Orlando, forcing me to come out when all I want to do is stay in rainy England! I’m glad SeaWorld is spending more on the attractions, but maybe the money could be spent on improving animal habitats? This is so exciting and I think it would be awesome if they actually themed the coaster to a shark and not just any shark I think it should be themed to a great white shark. Could it be a Sheikra clone? This sounds to me like a shark-themed roller coaster. Well, long ago there was a shark bigger than the Great White called the Megalodon that lived in the Cenozoic Era (15.9 to 2.6 million years ago). Unfortunately, the Megalodon is extinct. It is estimated to be about 98 feet long in length. I thought since the roller coaster SeaWorld Orlando plans on building would be about 200 feet tall and would have a shark-theme, maybe it can be called “Megalodon” since the word MEGA is in the word Megalodon. I’m hoping for a B&M Hyper coaster like Behemoth at Canada’s Wonderland, Intimidator at Carowinds and Diamondback at Kings Island that will be at your park next year. A Megalodon would sound like a fierce predator to me, don’t you think? It sounds much more fierce than a Great White! 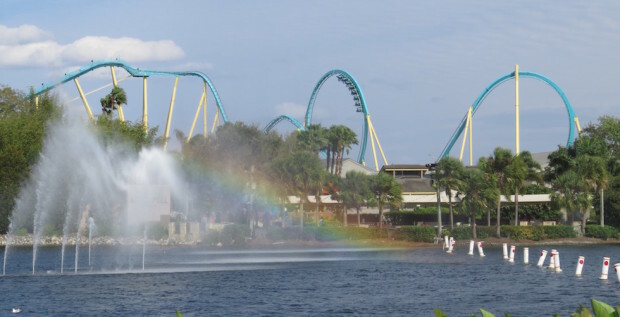 I imagine that if the coaster SeaWorld Orlando plans on unleashing is in fact a B&M hyper, and in fact does have a Megalodon theme, the first drop would plummet into the mouth of a Megalodon and would go through an underwater tunnel hopefully. That would be cool. I would like there to be a splashdown element during part of the ride like how Diamondback at Kings Island has. I am too excited and cannot wait for the cat to be let out of the bag in late-May! I cannot wait to hear the full details! I will hopefully show up at SeaWorld Orlando next year and will take a ride on whatever is planned for next year!! !